From snow blizzards to heat-waves, we’ve had it all since our last posting. The energy is high and new ideas are rapidly unfurling at Pentiddy. 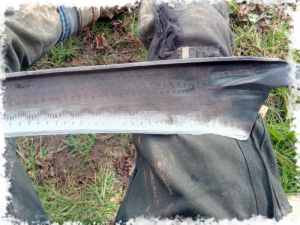 We were anticipating sitting back and enjoying the feeling of having completed the coppicing for the year but the land here had other ideas….and plenty of them! So, yes, the Hazel coupe is all cut. Considering it was a first cut we weren’t sure what we’d get out of it but we’ve been pleasantly surprised at how much we’ve managed to sell and use. 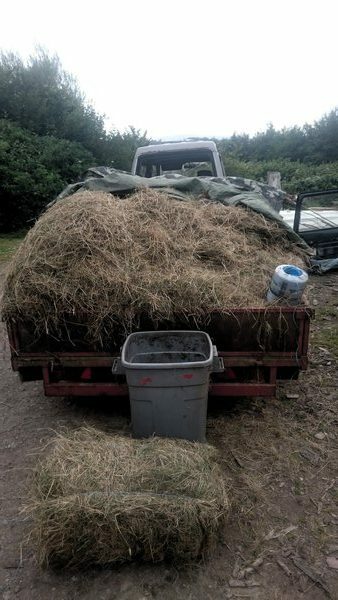 A wide variety of products have been extracted including hedging stakes and binders, pea sticks, bean poles, bale spikes for 2 straw bale houses and weavers for fencing. 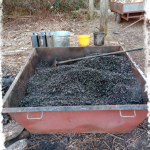 The rest will go for firewood and charcoal and the tops are being converted to biochar in Tim’s Oregon kiln or being chipped for use on paths and on beds in the forest garden. Duchy of Cornwall Nurseries and Goldenbank Nursery have been very keen to buy our local products to sell in their shops but sales will depend on the mark-up they put on them. Today we were making up sample batches of liggers, gads and spars to take up to the Guild of Master Thatchers to see if we can persuade them to use UK grown material instead of cheaper Polish imports. The remaining weavers that we didn’t manage to sell are going towards re-building the walls of the roundhouse to replace the planks which were only ever intended to be temporary but have been in place for 10 years! 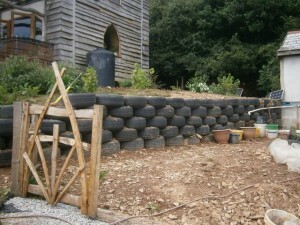 The new walls will be wattle and lime. We will be opening this up as a community project from the 7th to the 11th of May. 11am – 5pm (sorry for the short notice!) Materials are being paid for by donations we’ve collected from people who have used the roundhouse over the last few years. If you would like to get involved please let us know so we can arrange tools etc. Please bring lunch to share. 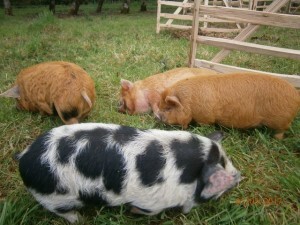 We hope to have a BBQ on the Saturday evening. 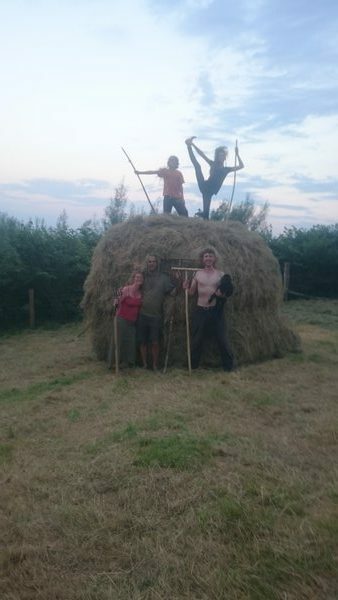 We managed to fit in some lengths of hedge-laying before the season ended. We laid West-country style on top of the hedge banks and South of England style on the new hedge by the house. Hannan and Ele have worked up a £10,000 grant application for work on re-building, repairing and laying lengths of hedge all round Pentiddy. If successful there will be plenty of opportunities for anyone wanting to come along and learn the skills involved. It’s been a really busy start to the year in the burial site with some beautiful ceremonies and, with a bit of encouragement, an increasing number of families willing to take on more themselves rather than handing everything over to funeral directors. 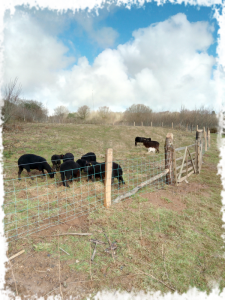 The wild-flower burial area is finally fenced and the sheep have been busy grazing in there. We are now ready to start looking at the rest of the process. The top soil that was removed from the area years ago is needing to find a new home. If you are interested in a large quantity of top soil then please get in touch so we can discuss logistics. The sheep have been sheared mostly by Tim this year following on from a blade shearing day we attended at Fernhill Farm near Bristol. There’s a lot to it and it will take quite a bit of practice to get it down to 3 minutes per sheep but Tim’s determined. I now have some more fleeces ready for shroud making. 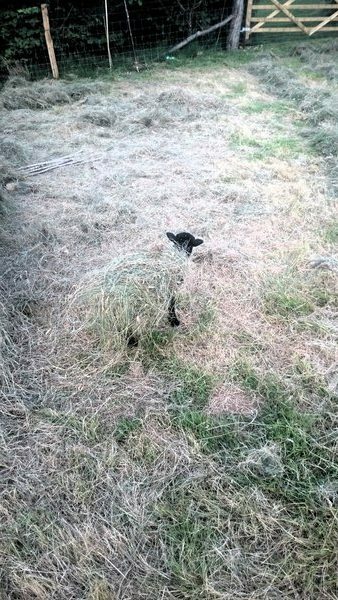 Our first lamb was born on Easter day but no more yet so we’re not sure what’s happening there. 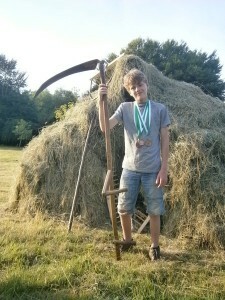 From one sharp tool to another, the scything has begun! Kevin Austin of Skygrove hosted a peening day to help us all to get our blades hammered out and sharpened up ready for hay-making. We picked up plenty of tips from the expert. We will be working with him and others as a mowing team over the Summer so if you have fields that need mowing let us know! 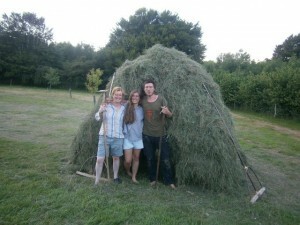 If you’re interested in getting involved at hay-making time then get in touch and we’ll keep you posted- or keep an eye on our events calendar. 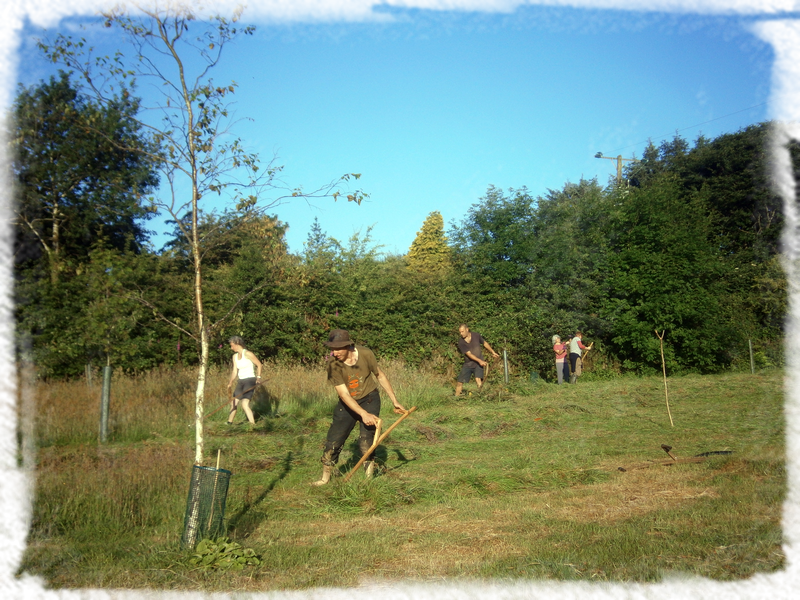 The Community Woodland work days were staggeringly well attended this year. Many thanks to all of you who leant a hand and a good vibe to the days. 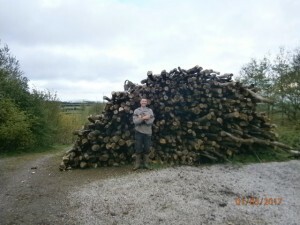 There are large quantities of top quality firewood available and more to come over the next few years as Ash Die-back has well-and-truly hit. We have purchased a new trailer for the car so we can now deliver 1m³ loads for £120. The last few weekends have seen us attending 3 really interesting meetings relating to getting more happening in Cornwall regarding sustainable land use and community building. The first was the Land Workers Alliance’s first South West regional meeting. This was a very well attended and inspiring weekend with some very good networking amongst other land workers and policy makers. 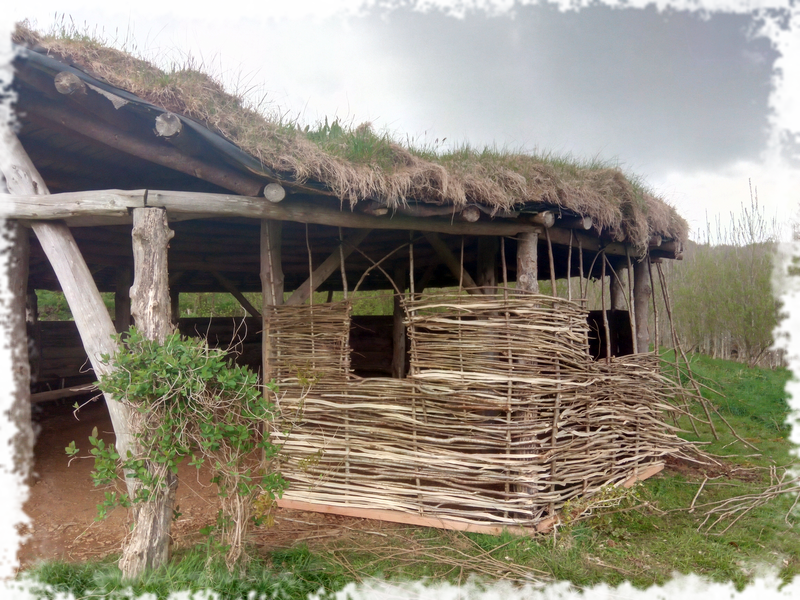 It also included the opportunity to look around the various projects based on the Dartington Estate of which there are many from forest gardens to CSA schemes and field-scale permaculture designs. We have returned with renewed enthusiasm for my budding forest garden which is really starting to come together. We’re now thinking of setting up a Liskeard area land workers group – watch this space! 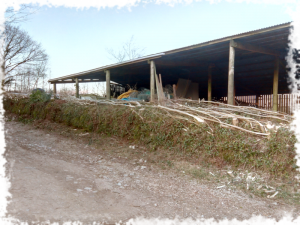 We also attended the Cornwall Coppice Group meeting at Devichoys Woods where Tom Kemp has been coppicing. 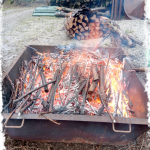 He and Nick Jarvis have started a community supported firewood project which also encourages volunteers to get involved in sustainable woodland management. This was on the same weekend as the Cornwall ‘Village building’ Art of Mentoring event designed to connect together those wanting to look at ways to create more holistic communities throughout Cornwall and sharing ideas on how to achieve this. We’re following this up by going along to the Nature Culture Regeneration weekend in May on Dartmoor. We’ll report back……. We are set for a great season with a solid team; Tim, Hannan, Esme with Tom as a new addition this week. We are also currently interviewing for the Internship for October and have some very promising candidates. 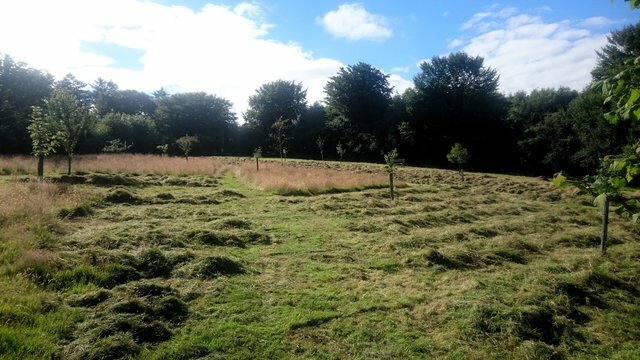 Tim is taking on increasing levels of responsibility and we’re trying to balance that by offering him the management of areas of coppice and mature woodland for him to try out some of his many masterplans. Since putting him through his chainsaw training last year, the weight of all the felling and processing of timber has been lifted from Anthony who is enjoying returning at last to crafting and teaching. 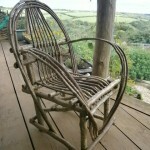 The second Hazel chair course took place earlier this month and produced some great furniture. More courses will be offered in the Autumn to include post and rung stools and a full chair-making course. Firewood– 1m³ – £120 – green ash, alder or mix- ringed/split – buy now and it will be ready for the winter… delivery free within a 10mile radius.